A leather jacket is one of the classic pieces everyone wants to have in their wardrobe. They are versatile, comfortable, and add a certain stylish air to any outfit. When you have a genuine leather jacket, the upkeep is essential. Making sure that your jacket is properly cleaned and cared for will determine how long it lasts. Leather jackets tend to lose their buttons more quickly than other types of clothing. That’s why it’s important to learn how to sew a button on a leather jacket. To read about leather jackets that I recommend, click here. Before you learn exactly how to sew a button on a leather jacket, you need to collect the necessary equipment to do so. It’s a good idea to keep these items on hand at all times when you own a leather jacket, so if the need arises to sew on a button, you will be prepared to do so. Replacement buttons. Try to choose buttons that match the rest of the buttons on your jacket. Use any buttons that came with the jacket. You may want to consider replacing the whole set of buttons on a leather jacket when you lose one, as it is usually easier and more cost-efficient. Prepare your needle and fingers. Before beginning think about which finger you plan to use most during the sewing process. This is a different finger for everyone. Choose your dominant hand and decide which finger you believe will do the most work. Protect this finger with the thimble. Once you have put on your thimble, thread the needle with the heavy duty thread and tie a knot at the end of the thread so it stays put. Sew the button onto the coat. Begin at the back of the jacket and take the heavy gauge needle and push it through the jacket to line up with a hole in the button. Use pliers to push the needle all the way through to the other side of the jacket. Pull the thread through tightly enough to keep the button in place, but loose enough to allow for adjustment. Add the backer button. When you have secured the button, pick up the backer button and secure it in place on the underside of the coat by running the thread through one hole and then another. Final touches. Continue threading through the holes of the button and back button until they are secured firmly in place with little give. Make a know at the underside of the jacket and cut the remaining thread. Straighten the button on the coat and move on to the next button. Knowing how to sew buttons onto your leather coat is just one aspect of proper leather care. If you want to keep your jacket in prime shape for the longest possible amount of time, it’s important to know how to care for the leather. I recommend that you check out a leather cleaning kit by Anthony’s Leatherworks that is available on Amazon. Proper Storage: when you’re not using your leather jacket due to the season, make sure that you store it properly to prevent any damage. Your leather jacket should be stored in a cool, dry place to avoid the growth of mildew. 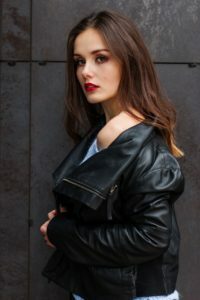 Moisturize Your Leather: if you notice that your leather jacket looks like it is starting to crack, it is time to moisturize it. Invest in a good quality leather dressing or leather cream and treat your jacket with the product. 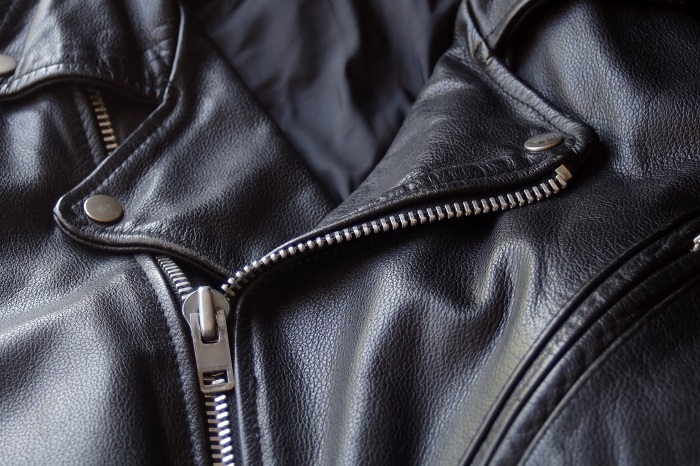 Even if you have your leather jacket stored away for months at a time, you should take it out every once in a while for moisturizing. Consistent Cleaning: you need to create a cleaning schedule for your leather jacket if you want to keep it in optimal condition. Try to clean your jacket at least once a week by wiping it down with a wet cloth. Do not use any soap or cleansers on your jacket. Proper Drying: if your jacket gets wet in the rain or another way, it’s vital to allow it to dry naturally. Do not put the leather jacket near a fire, in the sun, or near a heater to dry. Leave it to dry at room temperature on its own. This process may take some time, allow it. Baby wipes. They are highly alkaline and harmful to leather. Neatsfoot oil. Although this is a product marketed for leather, it actually causes damage. Mayonnaise. This is not a good item for a DIY leather conditioner, as it stains. Any oils. Although they will work as leather conditioners for a short period of time, they will cause long-term damage as they oxidize and harden your leather jacket. Do not let stains set in. Deal with scuffs and spills as soon as possible. Use a stain protector (available on Amazon) in spray form to activate water resistance for optimal protection. Try to maintain the shape of your leather jacket or reshape it if you notice a change. Keep your leather jacket clean and conditioned for prime shelf-life. Stick to a cleaning schedule to ensure that your leather jacket gets consistent care. Plan ahead for proper storage for your leather jacket when it’s not in use. Owning a leather jacket is stylish and fun, as long as you stay on top of the upkeep. Learning the skill of sewing buttons onto leather jackets will allow you to have more control over the care of your jacket.